Try our Cheesy Tortilla Soup as an alternative to traditional chicken soups. 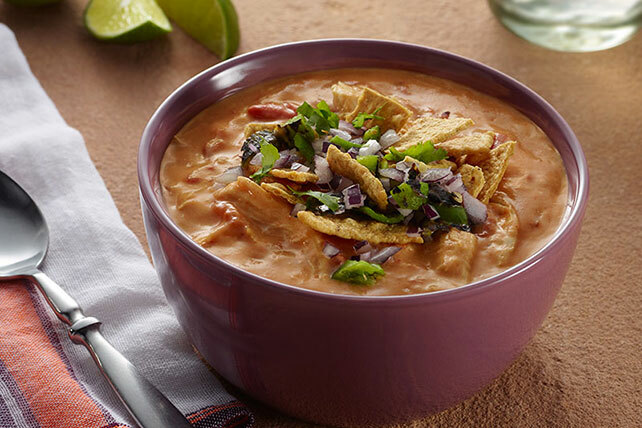 The spice of Cheesy Tortilla Soup is topped with crunchy tortilla chip bits. Serve this hearty main-dish soup with a mixed green salad tossed with your favorite KRAFT Lite Dressing. Chop 1 each small green pepper and onion; combine with 2 Tbsp. chopped fresh cilantro. Spoon over individual bowls of soup just before serving.